Your search for a free wordpress autoresponder plugin ends here. 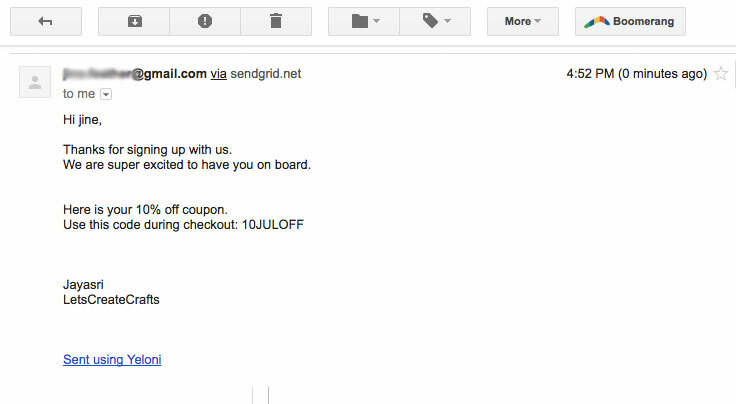 In this article, we explore Yeloni’s free email autoresponder feature that enables businesses to send a free email to their new subscribers. You’ve set up an effective lead capture widget and your visitors seem to be loving it, you can tell that much from your growing subscriber list! Next step would be to set up an email autoresponder that reaches your subscriber’s inbox. Something that works perfectly, integrates with wordpress as an autoresponder plugin and preferably free. Right? Yeloni’s wordpress autoresponder plugin does just that – and it’s completely free to use. There are a few alternatives to setup email autoresponders in the market today that send emails to new subscribers. Most of these however, are free to begin with but start digging a hole in your pocket once the number of subscribers grow. Note that we mentioned – number of subscribers. In a nutshell, the business ends up paying dollars even to store the subscribers – even though it maynot be sending any emails. 2000-5000 subscribers — $50/month and onwards..
plus there is a cap on the number of emails that can be sent per month. Too many restrictions. Not good for business. With Yeloni’s Exit Popup plugin, not only can you design & install high converting signup widgets on your website but you can also send automated email responders automatically – all for free. Why use 2-3 products when just 1 does the job? Easy to maintain and easy to measure. Or just sending a welcome email to follow up with a customer. Yeloni’s free autoresponder service is free with every email signup widget that you setup. Here’s how to activate and use this feature. Start with downloading Yeloni Exit Popup plugin from here and follow the steps below to setup and email signup widget and the autoresponder service. Install Yeloni Exit Popup wordpress plugin and create a new widget. 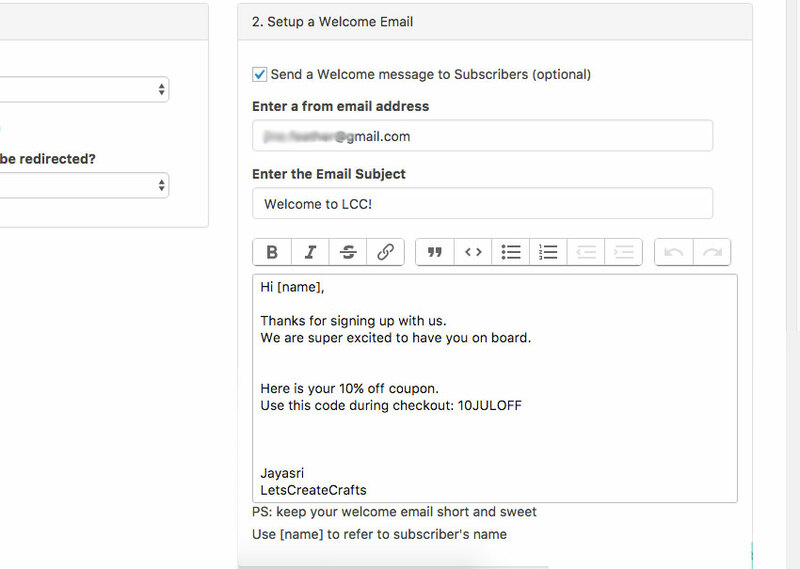 Choose from any of the email signup form templates. In the ‘design’ screen, customize the widget to match your business website. This is a real-time editor that enables you to see changes as soon as you make them. In the ‘integrate’ screen, you can choose your email provider from the drop down box. If your email provider is not listed here, please drop us an email on [email protected] and we will build an integration. Meanwhile, choose the ‘I don’t have an email provider’ option. A few more options are shown. You can choose if you’d like to show the ‘name’ text field and also specify where the user is taken after subscription. Proceed with setting the ‘from’ email and email subject line along with the email content. Use [name] to refer to the subscriber’s name in the email body. Once done, save the widget. In this example, we had configured a popup. Here’s how it looks on the website. Let’s signup and test it out! Immediately after the signup, we get an email like this in our email inbox. Note that the [name] was replaced by the subscriber’s name, which was Jine in this case. Looking for some autoresponder email templates? Click here for a composition top 10 autoresponders that you can send to your new subscribers. Please feel free to drop us an email here or ping us using the chat box below.